As I did early last year, I’d written a review of my favorite book of 2013. However, as I was putting the last couple paragraphs together, it became increasingly clear that posting this review was a bad idea. You see, the book was an anthology and the person who had compiled that collection of short stories is putting together a new anthology for 2014. I want to be in that anthology and wrote an awesome story that is almost ready to send. Here is the train wreck I just avoided—if my story is selected for the anthology, would it be because my story rocked, or because of my ability to butter up the editor by praising his earlier achievements? What would it say about that editor to all the other authors? Would it say that by writing a favorable review you’ll get a free pass into his next anthology? Or would he say “F-you punk, flattery will get you nowhere,” and I’m rejected by default? See how I almost sabotaged my chance? Either way, I will post that review whether he accepts or rejects my work, just not now. My integrity is worth something, even if there isn’t much left. As many of you know, I’ve been busy with short stories since the difficult situation that has become Damnation Books. If you need a publisher, look somewhere else. They don’t promote their authors–they price their books a lot higher ($11-$15 higher) than most mass market paperbacks–and they will hold your story hostage for 5-years unless they’re paid $1,000. That is the deal I signed to get into print, a deal with the devil, if you will. So, while I’m deciding if I will pay their ransom, I’ve sent out a few short stories over the past couple months. 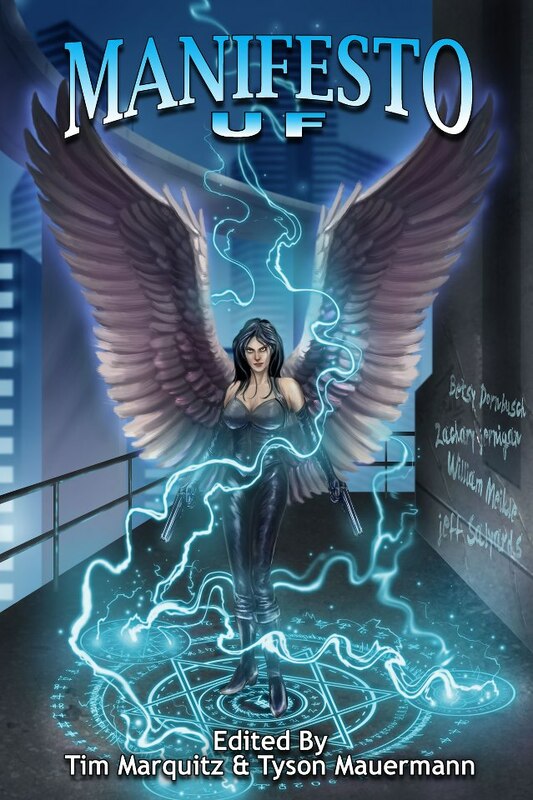 This is the latest anthology; good urban fantasy written by top-shelf authors. My third novel is written, but not finished. I don’t like the ending battle. For my patient fans, I promise to focus on the issue and wrap it up by the end of the coming year. To offer a little scope of this third book, The Wrong Way Down was 82,000 words, and book three is currently 130,000 words. I’m hoping to cut it down a little bit over the next couple of drafts. Every last Friday for the next twelve months, I’ll be working with NIWA/Jacobsen’s Books for their 2014 Bards and Brews event at Primrose and Tumbleweeds (wine bar and restaurant) in downtown Hillsboro. This is the place to drink great local beers and wines while listening to new and experienced authors reading their works live. At the Symposium, I will be there to learn and to share. I will have a signing table and expect to have all three anthologies as well as whatever straggling novels I still have with me. All books will be priced to sell—I need money to buy my rights back from Damnation. Also in February, I will post an interview with Zachary Jernigan, author of last year’s hot new release, No Return. I haven’t booked any other authors yet, but trust me, I’ll get them. I’m really going to make it this year, WHC is here in Portland. It would be pathetic if I couldn’t make it this year. Orycon is still a ways down the road, but I’ll be there. That’s what is carved in stone as of January 1st, 2014. It is a good beginning to a new year.